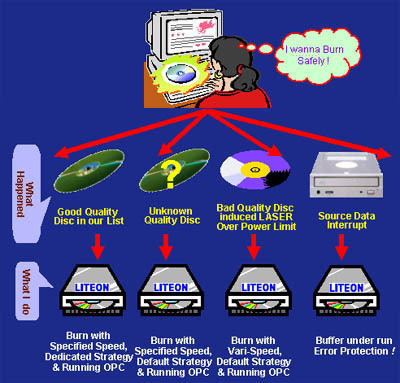 SMART-BURN is the abbreviation of " Smart Monitoring & Adapting Recording Technology for BURNing ", innovated CD-RW technology by LITE-ON IT, will be introduced to other products in the future. 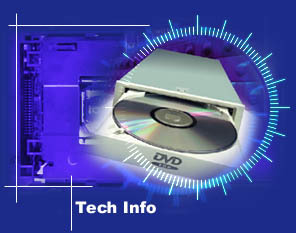 Users always want to successfully burn a disc with a higher speed in CD-RW drive. You may know, there are so many brands of CD-R / CD-RW media in the market with irregular quality & still being cost down in the price war. LITE-ON IT try hard to collect various kinds of media to come out the dedicated optimized writing strategy parameters plus the outstanding running Optimum Power Calibration ( OPC ) function to provide you the best burning quality. If your CD-R / CD-RW media quality is really poor enough or working environment is too hot to induce the Laser Power over margin, the CD-RW drive detected, the burning speed will be forced to decrease to get more reliable Laser working power to secure the life of CD-RW drive & burning quality. The buffer under run error is also no longer happened to your drive anymore, SMART-BURN also can allow drive to be suspended during writing, than continue to burn from last point when enough data get in the buffer. Copyright © 2003 - 2005 LITE-ON IT Corp. All rights reserved.